Place carrots, potatoes, onion and celery in 3 1/2- to 5-quart slow cooker. Sprinkle half of the thyme, the salt and pepper over vegetables in slow cooker. Place chicken on vegetables. Pour broth over top. Cover and cook on low heat setting 7 to 8 hours or until juice of chicken is clear when center of thickest part is cut (180°F) and vegetables are tender. Add pea pods; cook 5 to 10 minutes or until crisp-tender. 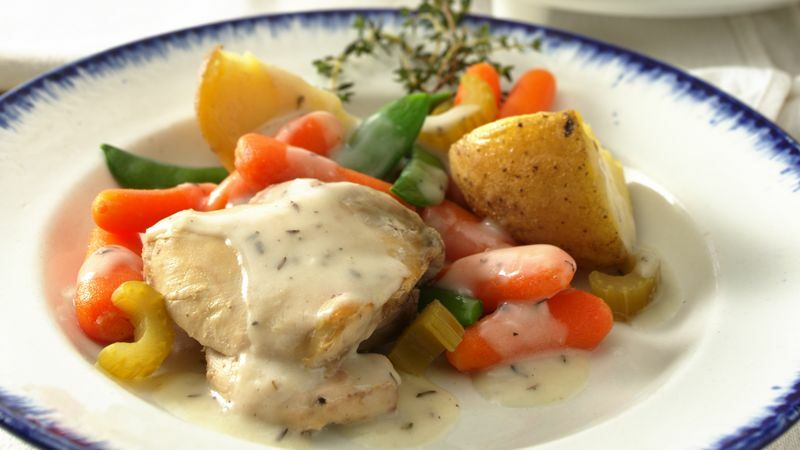 Remove chicken and vegetables from slow cooker to serving bowl, using slotted spoon. Cover with aluminum foil; keep warm. Increase cooker to high heat setting. Mix whipping cream, flour and remaining thyme; stir into liquid in cooker. Cover and cook about 10 minutes or until thickened. Pour over chicken and vegetables. Chop the onions and slice the celery the night before; refrigerate in plastic wrap or covered plastic containers. Wait until morning to cut potatoes to prevent their turning brown.